Whether you’re on the board of a large nonprofit or an all-volunteer board, you may have asked what your role is as a board member in contributing to your nonprofit’s mission. Legal compliance and financial oversight are certainly on the list of board responsibilities, but they’re not enough for effective governance. 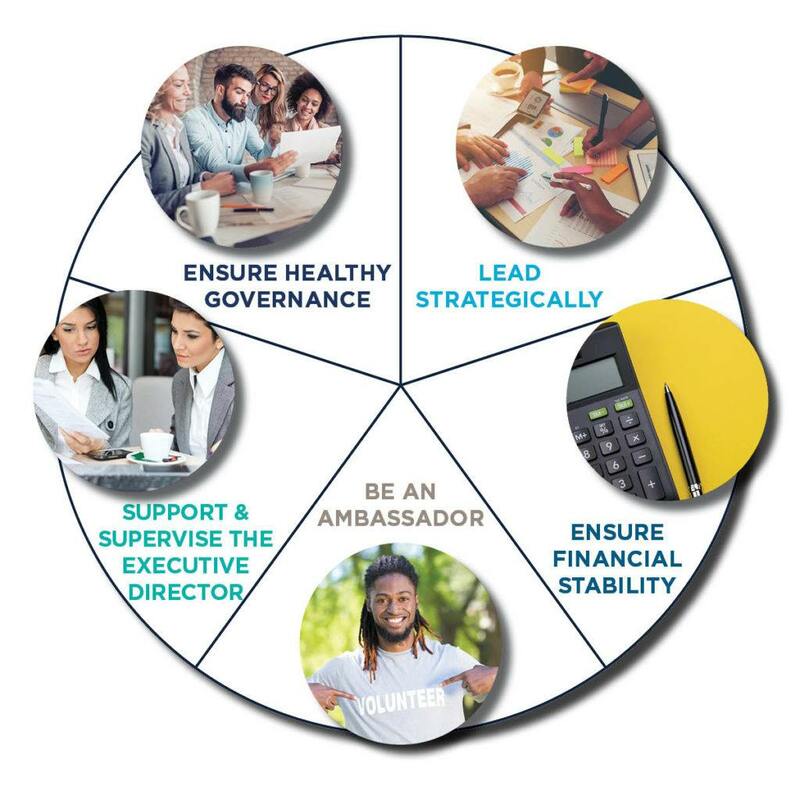 While your organization has a significant amount of latitude to define board governance in a way that best suits the nonprofit’s needs, at Propel Nonprofits, we believe board members have five primary responsibilities: providing strategic leadership, managing for financial stability, serving as an ambassador for the organization, supporting and supervising the executive director or CEO, and ensuring healthy governance. This resource is intended to help nonprofit board members clarify your role so you can be effective in carrying out your nonprofit’s mission. For nonprofits in Minnesota, the Attorney General’s Office has a guide for board members that is a must-read related to your fiduciary duties and what you’re legally responsible for; check with your respective Secretary of State and Attorney General for regulations. This guide is intended to supplement those baseline requirements. Develop and communicate the organization’s direction, goals, and a plan to get there. This may be a strategic plan. If there isn’t a strategic plan in place that articulates the organization’s mission, role in society, and direction for the future, partner with staff to create one. As a board, monitor outcomes related to the plan and revise as needed. Have robust board meetings that cut through the complexity of the environment in which your nonprofit is operating in order to assist organizational leadership in anticipating and navigating change. Understand the nonprofit’s business model and financial aspects. Ensure your organization has adequate infrastructure to create accurate and timely financials. Make sure your board is able to understand the nonprofit’s financial reports. Develop strategies to fund your mission that are realistic and that support your organization’s business model. Ensure financial reporting requirements are compliant with state regulations, including 990 filings, audits, and registration with the Secretary of State and Attorney General. Cultivate relationships that are beneficial to the organization’s strategies. Participate in fund development efforts of your organization. Board members are often encouraged to donate personally in an amount meaningful to them. Listen to community members’ needs related to your mission. As an organization, share the impact of your nonprofit on the community and how the community has supported you (e.g., an annual report or letter). Recruit and hire the Executive Director or CEO to lead and manage the organization. Supervise and evaluate the performance of the Executive Director annually. Have an emergency and long-term succession plan for the Executive Director. Ask the Executive Director how they want to be supported. Different Executive Directors need different support from their boards; welcomed management for one might be unwelcomed management for another. Review bylaws and maintain compliance. Develop a plan for board succession and officer leadership. Take responsibility for board business and create structures that align with getting that work done. Conduct a self-evaluation that allows board members to improve their governance practices. How does your board define success for its role in contributing to your mission today? Have a conversation as a board about what the organization needs from the board given its current life-stage, strategic direction, and staff attention to operations. Use this resource as a tool to ensure board members and leadership are on the same page. Clear expectations can contribute to deeper and more productive board engagement and help avoid conflict.